Though one witness the changing world and its many new ideas being implemented but we cannot deny an interesting characteristic of this new era. It can be said to be the time which exhibits the new version of old yet meaningful traditions which remind us of the beauty, grace and sophisticated taste in finer things in life. It is this creative and artistic pleasure that attracts us towards these aesthetically high creations spelling out the royal way of living. Inspired from the lifestyle of the bygone days, Box Scroll Invitations display amazingly vivid and elegant designs of the present era with their roots in the rich past. Inviting people in style has always been the part of our traditions. This art is being revived in the form of exclusively designed invitation cards that are as charming and as mesmerising as you want them to be. Professional card designers have shown their passion to create and design liveliest and the most vibrant invites in different genres. 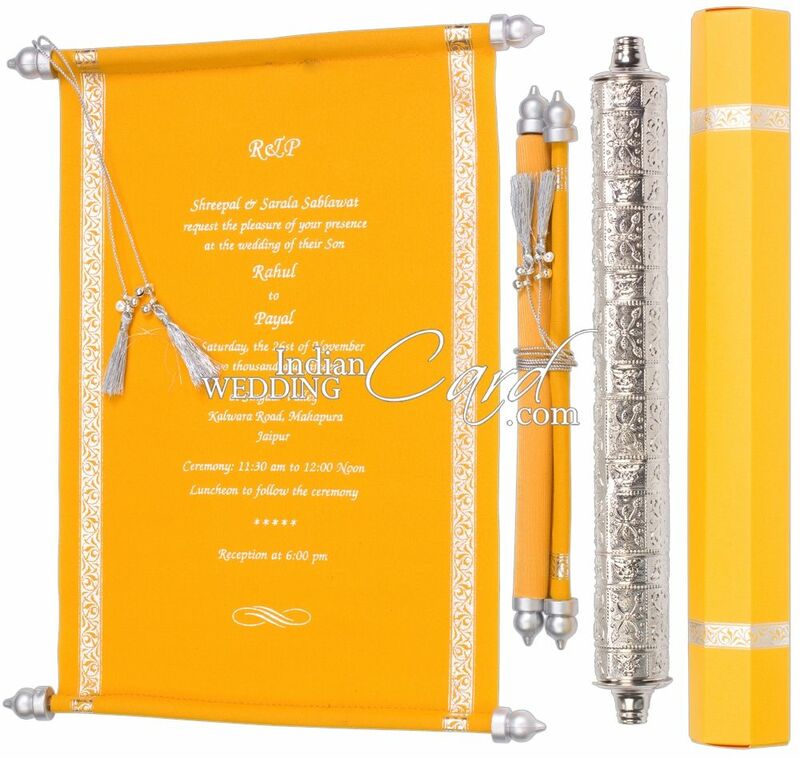 Scrolls have been extensively used since ancient times when they played the role of the messengers between lovers or the royal families. They were sent as the only mode of communication exhibiting their utility and the necessity of time. Now the world sees them as a beautiful way of expressing hospitality of an earnest host. 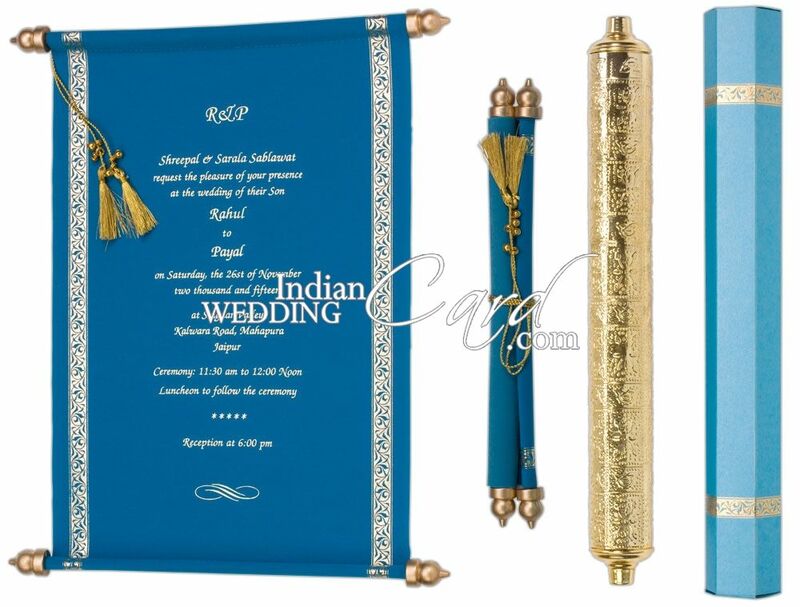 These scrolls display opulence and luxury in a very exclusive manner. When they are sent with a handcrafted box, it completes the inspiration and emits a feeling of being the part of some majestic event. No other invite can evoke such awe-struck emotions as this duo in array of colours. The boxes are with laser cut designs which are immensely intricate and reflect the fine art work of the designer or the artist. 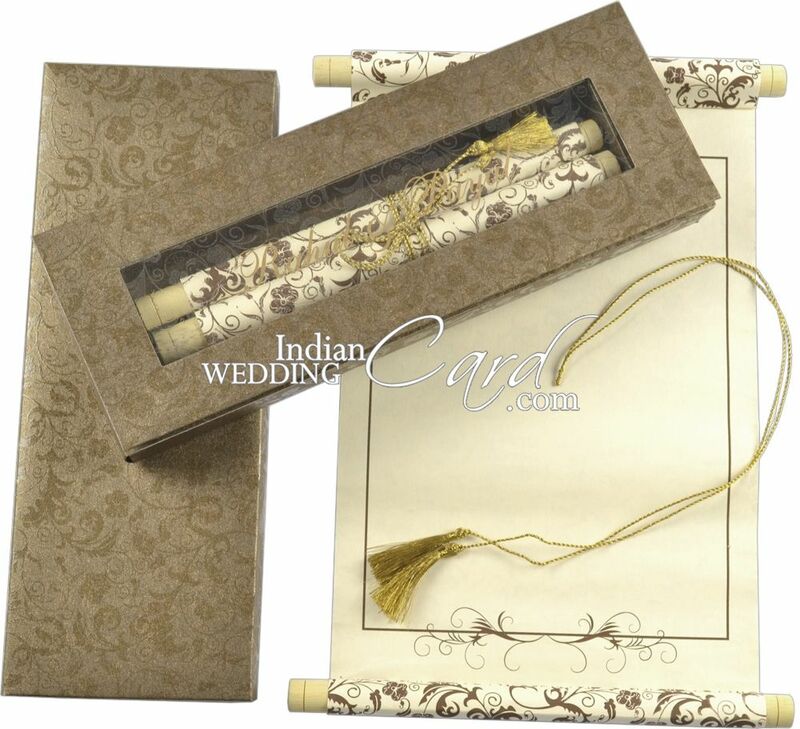 When Indian Wedding Card gets to work, it works with complete dedication which results in perfection and freshness of ideas, novel and real with imagination at its best. 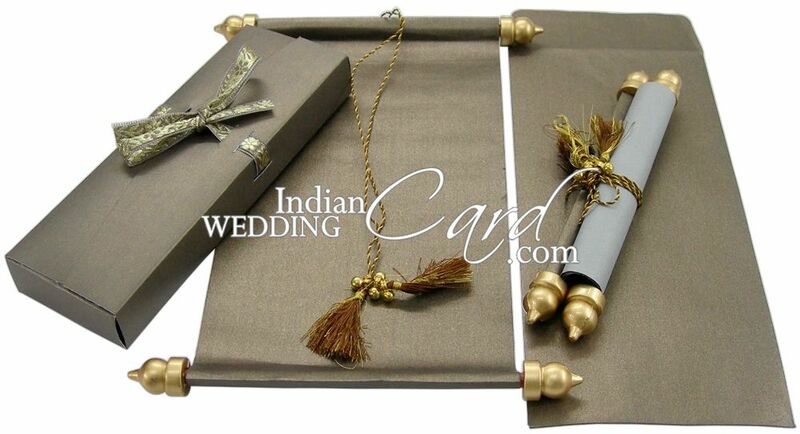 We, at Indian Wedding Card love to create our invitation cards with a difference. Each of our categories has plethora of sub-headings that means a treasure of choices. When it comes to box scroll cards we leave no stone unturned to bring to you what tickles your imagination and give you the most wonderful and most magnificent variety. These scrolls, apart from being in array of colours are decorated as per our customers’ choice and taste with stones, tassels, ribbons, etc. The boxes too, apart from being delicately and intricately designed are aesthetically created to add to our customers’ pleasure. These invites do give some ‘wow’ moments to your guests who cannot help admiring them again and again. They surely are inspiring and set an indelible impression of panache and royal style of the host. When our team of ace designers create their designs, they actually create a piece of art, rare and unique to be loved and cherished always. Browse through our collection and place your order.